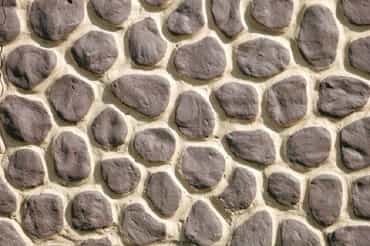 Stone walling: Pebble-dash treatment is cheaper than stone cladding. How can we stop the leakage in our ceiling? The source of the leakage is in the flat above ours. Assuming that the plumbing pipes in the floor above are buried inside the ceiling of your apartment and that these pipes are not accessible from below, the leakage can only be stopped by plugging the leak or the source of it. Whenever water accumulates at a given location, it will find a path to travel further till it joins the natural cycle of evaporation and precipitation. So, for instance, even if you treat the underside of the affected ceiling, the water will travel horizontally till it finds another weak spot and then travel down into your apartment at another location. So request the occupants of the floor above to allow you to seal the leak at source (in their flat). Be glad if they let you. On rare occasions, some people even share costs for such repairs. A non-invasive repair of a leak from floor traps (at the mouth of a drain, say) is quick but temporary (for the reasons given above). One of the methods is to apply a waterproofing compound by hand on the inner surface of the pipe through the open-to-floor mouth, going inward as far back as the hand can reach. Repair of punctured pipes buried under flooring, however, is only possible by dismantling and replacing existing pipes with new ones, and/or refinishing the entire bathroom. If nothing else works, you can try installing a sheet-metal (tin or galvanized iron) drip tray below the damp ceiling to collect and channelize the excess water towards your existing plumbing. This is similar to the drip-tray arrangement used in window air conditioners. To account for changes in water discharge from the ceiling, the drip-tray size should be larger than the current damp patch. Now hide this drip tray with a false ceiling. Make sure you use only water-resistant materials in the false ceiling, and hope for the best. I would like to use blue quartzite stone in random stone masonry on the base and chimney of my building. I don’t know where to source the material or the artisans to do the cladding work. Blue quartz stone is freely available in Delhi. Additional transportation cost to Amritsar will be around Rs8,000 per truck (of 11-tonne capacity, or include an additional Rs6-7.5 per sq. ft). If locating raw material or skilled labour for working with the stone is a problem, then you could talk to some of the established local contractors and give out this part of the job as a “with-material contract". You should expect rates in the Rs60-80 per sq. ft range for random rubble masonry (material plus labour), and Rs145-180 per sq. ft for dressed stone masonry (material plus labour). The cost will definitely reduce if you do it in-house, but for that you would have to know where to source both the material and the skilled labour. Variation in estimated costs can happen, owing to factors such as material sourcing, availability of labour, and their skill level. • Rough granite could be an excellent option. Select the colour very carefully. Horizontal grooves at every 1ft 6 inches to 2ft, along with simple stone moulding along the junction between stone and neighbouring plaster or exposed brick, can add structure to the design. • Machine-cut Dholpur stone (light biscuit brown) also looks good in an exposed brick building. Selection of even-toned (spotless) stone is critical here. Follow a design pattern similar to the above for enhanced results. • You could also get pebble-dash (dhulai dana) instead of stone in case you want to save cost. • Simple grooves in plaster and painting are still the most inexpensive option in case you want to defer the stone-fixing cost to a later date. • Black cuddapah or slate are too dark and absorb moisture and heat. Grey or bronze mica stone has a little gloss and can be a viable alternative only if done well (add a waterproofing compound in the fixing mortar). • Bush-hammered (yellow or greenish grey) Kota stone tends to pick up dirt and looks dull very soon. Navneet Malhotra is a Delhi-based architect.